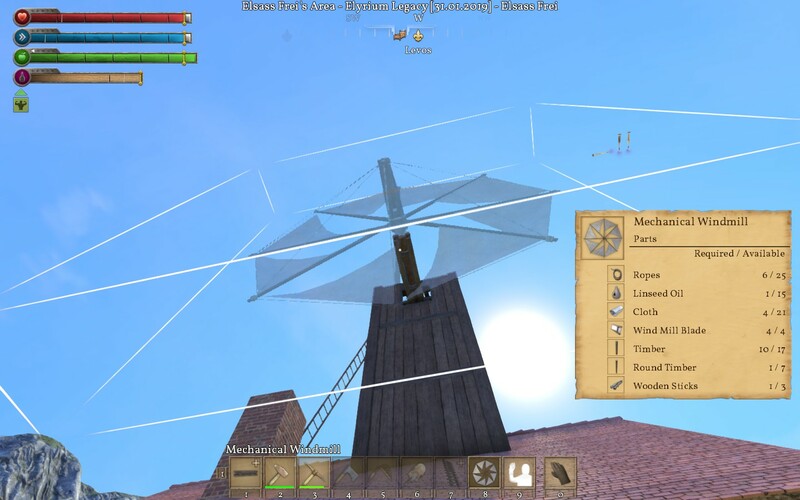 Discussion in 'Gameplay Help' started by Elsassfrei, Feb 1, 2019.
windmill has been added more than one year ago now, and are still so impossible to place. Neither you cannot rotate them, or like now it's in the good orientation, appears white, got all the stuff to build it, and NOTHING happen when I click my mouse. What do I need to do to be able to place it?? I also tried with a framed one, it made no difference. But I placed a mill on an horizontal piece before, it's always been working so far. just checking something - that piece gets placed but needs to be constructed with your hammer, so the white frame says all resources are in your inventory but then one needs to LMB hammer it to complete the construction and then it spins, so sorry if this sounds basic but sometimes i go through this... are you building it after placing it? I suspect the roof. The white may be a lie. Try one block higher or out one more horizontal and see if it 'clears'. are there three hovering torch stands in the upper right and behind the mill blades? two going one way and another pointing away? oh, try to get closer when placing, go up that ladder to the left and place some planks or timbers to get closer? i have had to try placing it repeatedly; and sometimes i have to build a massive timber thingy just to place that last windmill blade large piece. its a pain! But I also tried to remove the roof, didn't work.